The next speaker in our student seminar series will be Farid Sheikhi. 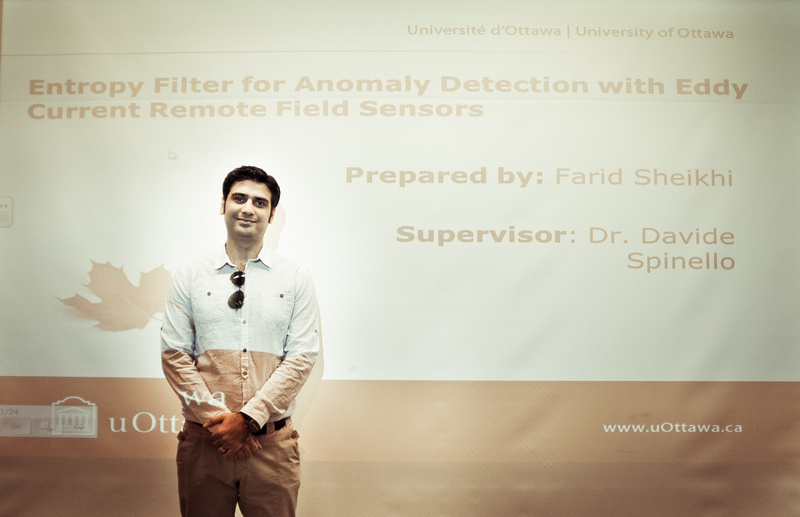 Farid will be giving a talk titled “Entropy Filter for Anomaly Detection with Eddy Current Remote Field Sensors”. We consider the problem of extracting a specific feature from a noisy signal generated by a multi-channels Remote Field Eddy Current Sensor. The sensor is installed on a mobile robot whose mission is the detection of anomalous regions in metal pipelines. Given the presence of noise that characterizes the data series, anomaly signals could be masked by noise and therefore difficult to identify in some instances. In order to enhance signal peaks that potentially identify anomalies we consider an entropy filter built on a posteriori probability density functions associated with data series. Thresholds based on the Neyman-Pearson criterion for hypothesis testing are derived. The algorithmic tool is applied to the analysis of data from a portion of pipeline with a set of anomalies introduced at predetermined locations. Critical areas identifying anomalies capture the set of damaged locations, demonstrating the effectiveness of the filter in detection with Remote Field Eddy Current Sensor.